Our division is starting to use a new online system, Interactive Achievement, to help teachers with data collection, SOL test prep, and Benchmark Tests. Here are handouts to help you out with the new system. I found this great math site by Glencoe on a blog I recently started following, InTech InSights by Karen Ogen. 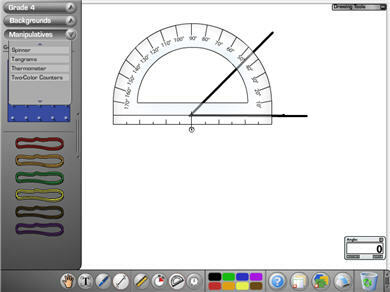 I am always looking for ways to practice the online tools that are similar to those used in testing, and this site has both a ruler (which doesn’t have the zero line at the end) and a protractor. Not only is is great for testing, there are tons of other manipulatives, workmats, storyboards, and game mats available (Base Ten blocks and boards, balance activities, calendars, grids, clocks, money, shapes, spinners, thermometers, counters, fraction pieces, and a bunch of other items). 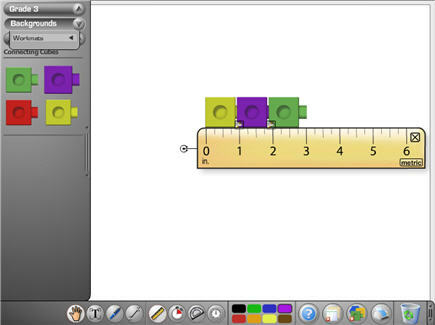 The site is great for PK-8th grade, and will work well on the ActivBoard! Check it out! The hard copies of the 2007 released items have been re-released. The 2007 items were available awhile back on the DOE Website, disappeared, and are now back! I have also downloaded the 2007 items to the G drive for your convenience (and in case they disappear again). Just go to G drive > Common > Released SOL Tests 2007. The 2007 Items are the same ones that are in the EPATs practice tests. Just wanted to pass along a website that was mentioned for SOL practice in the 5th grade meeting yesterday. It came from Mary Hollar at West Salem Elementary. It’s called www.thatquiz.org, and it has online review problems for Math…including a way to practice with a protractor and a ruler (be careful, though, since the cm ruler on this site starts at the end of the ruler). There is also an entire page of links that Pam and I have put together to allow you to practice for SOL tests using computers, including released practice tests from prior years (they don’t look exactly like the test, but they are still good practice). Take a look when you have a chance. To find it, go to Your school’s homepage>Students>Links for Kids>Your Grade Level>Online Testing Practice or click here.